You finally did it — you booked your first Kilimanjaro hike. While you’re probably feeling excited to climb one of the Seven Summits, it’s also totally normal to feel a little nervous about making sure you’re ready. So, when should you start training and what should you tackle first? The price of your airfare to Tanzania is usually not included when you book a Kilimanjaro hiking package with a trekking operator like Tusker. As you can probably expect, flights to Kilimanjaro International Airport (JRO), which is closest to the mount, are not cheap. They can range anywhere from $1,500–$4,000 per ticket. Unfortunately, the best time to climb Kilimanjaro may not be the best time to purchase tickets. That being said, you usually find lower fares for trips in September and October and higher fares June through August. When you book your Kilimanjaro hike, set a few alerts with apps and sites like Skyscanner, Hopper, and Momondo to let you know about great deals and affordable flights. 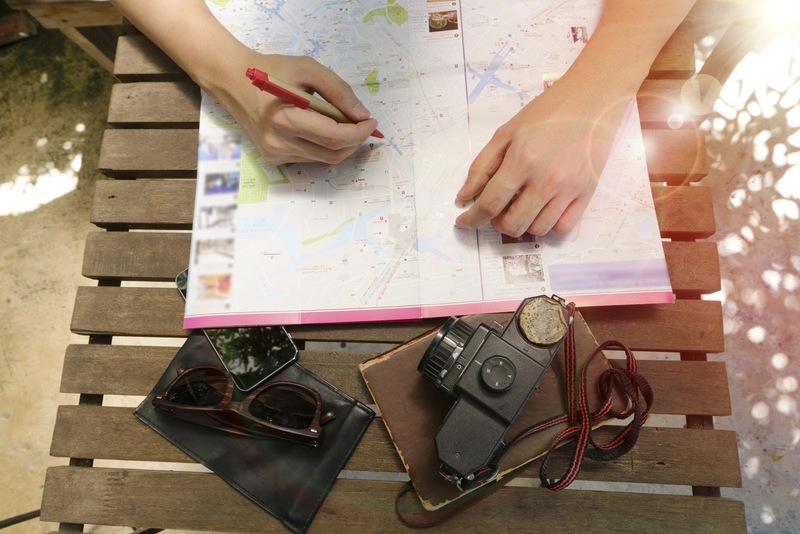 Then you can sit back and let technology monitor the fares while you get a head start on your packing list. Keep in mind that, if you choose Tusker for your hike, you’ll have transfers to/from Kilimanjaro International Airport included in your package. If you don’t already have a passport, you’ll need to follow the process for obtaining one in your country. Tanzanian law requires your passport to be valid for at least six months after your Kilimanjaro trek in order to gain entrance. Plus, you may be required to enter your passport number when you’re booking your flight. Therefore, not having a valid one could delay the rest of your plans. Here in the US, it can take up to eight weeks to receive a new passport that has expired without paying fees to expedite the process. People from the US, Canada, Australia, the UK, and several other countries are also required to have a visa to stay in Tanzania. You can purchase one when you arrive at the airport. However, the wait does usually take a few hours. We recommend saving your time by getting your visa at the Tanzania embassy in your home country before your trip. Most trekking companies require you to purchase travel insurance within two weeks of booking your Kilimanjaro hike. After tackling the first three steps on our list, finding the best hiking boots should be a top priority. You’ll be climbing uneven terrain with steep ascents and descents while hiking the mountain, so the right footwear is essential. Poor hiking boots may lead to sore feet, blisters, sprained ankles, and even back pain. You don’t want any of these to sideline you on the mountain. So, look for a waterproof pair of boots that fit well, provide proper ankle support, have deep lugs for extra grip and traction, and aren’t too heavy. Check out our recommendations for the top 20 boots for climbing Kilimanjaro and get our pro tips for keeping your feet happy on your hike. Never bring new hiking boots with you on your Kilimanjaro hike. Your hiking boots need to be broken-in until they adapt to your feet. Until this happens, you risk painful walks, blisters, lost toenails, and much more. Start hiking in your new boots before you even reach Kilimanjaro. Begin with 2–3 long hikes in the 3–6 hour range each week. This will really help break in your boots and get you accustomed to how they feel. To prepare your body for the climb and prevent injuries, you should train for at least two months before your Mount Kilimanjaro hike. Try to incorporate aerobic exercise, strength training, and extended walks on rough terrain (in your new boots, of course) to build up your stamina. You can even wear a 15-lb bag and walk on a treadmill at an incline to simulate the incline you’ll encounter on your Kilimanjaro trek. Before we get to your Kilimanjaro packing list, you should cross off the items your trail company provides, such as camping and dining tents or portable toilets. Additionally, think about the items that are important to have, but are simply too bulky and cumbersome to lug around on your flight (like a winter sleeping bag). For essentials like that, we recommend adding them to your “to rent” list. 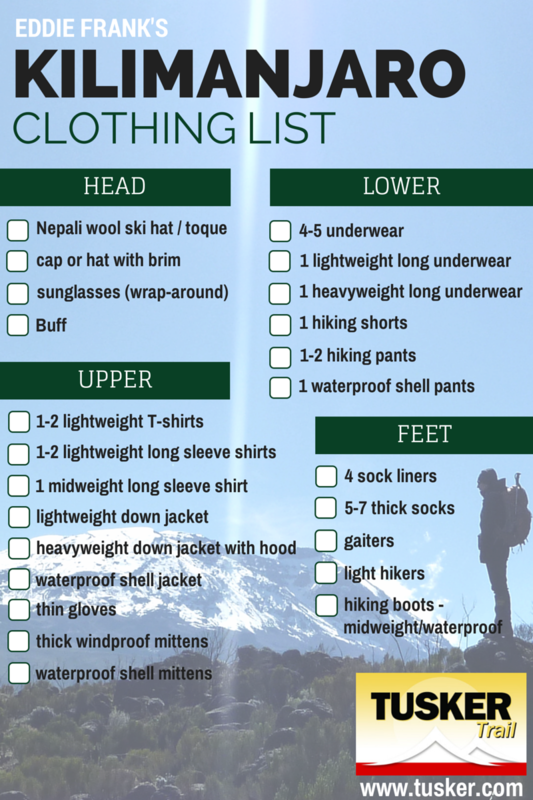 Once you have these accounted for it’s time to create your official Kilimanjaro packing list. Your trekking company will give you a complete packing list of essentials so you won’t feel the need to pack or buy everything stocked at your local outdoor store. Layering is crucial, as you’ll be trekking through five different climate zones on Kilimanjaro. You’ll need a variety of heavyweight, midweight and lightweight layers to stay comfortable. Protective clothing will shield your body from the elements as you face the cold, wind, rain and possibly snow. A heavyweight down jacket will keep you warm while a windproof, waterproof and breathable rain jacket will keep you dry. Windproof and waterproof gloves will also be essential for protecting your hands in the extreme temperatures. Do not use cotton as it gets wet and does not dry quickly. Merino wool layers, socks and gloves help regulate body temperature, wick moisture and have antibacterial properties to help when you’re without a washing machine. You’ll need a daypack on Kilimanjaro to carry your water and personal items, such as extra layers, sunscreen, a camera, etc. Your pack should have a 25-40 liter capacity and a comfortable hip strap to reduce the strain on your back. A backpack able to hold a hydration bladder is super convenient as are side mesh pockets to allow you access to other items easily. Make sure your pack has a rain cover too. Tusker Trail issues all climbers a waterproof duffle bag in which to store your personal duffle bag containing gear you don’t need access to while hiking. The Tusker porters will carry this up the mountain for you to access at camp. Check out our insider Kilimanjaro packing tips for staying warm and dry while still keeping your backpack light. In addition to non-negotiables such as hiking boots, a water containment system and base layers, you’ll also want to decide which creature comforts you’ll need to keep you mentally motivated during your hike. Will you need your favorite workout playlist on summit days? Earplugs to drown out your trail mates’ snores? Special energy bars to snack on when you’re hungry? Write down your list, but don’t fall victim to overpacking. You should receive medical clearance from your doctor before booking your Kilimanjaro trek, but even when they do go for their checkup, many people skip speaking to their physicians about Acute Mountain Sickness (AMS). Frequently referred to as altitude sickness, AMS is the physical distress your body goes through when it has a difficult time adjusting to lower oxygen pressure at high altitude, according to Healthline. Stats say more than half of all climbers never reach Uhuru – Kilimanjaro’s peak – due to the effects of altitude on their body. Symptoms include dizziness, heachache, shortness of breath and nausea. Any of these can quickly derail your ascent to the top and AMS can happen to anyone — regardless of how fit, young or experienced you are with climbing mountains. In fact, if you’ve reached other peaks before, you may be more tempted to ignore the signs and power through to the top at your own peril. But it’s important to always listen to your body. Ask your doctor if adding a prescription for Acetazolamide (Diamox) will help make your Mount Kilimanjaro hike a success. It may help you acclimate to higher altitudes faster so you ward off the effects of AMS better. In Tanzania, the official language is Swahili. How are you? … Habari Yako? Speak English? … Unazungumza Kiingereza? We’re Ready for Your First Kilimanjaro Hike. Are You? The best time to climb Kilimanjaro is right now. After you find a trustworthy hiking company like Tusker, choose a date and hiking route that speaks to your sense of wanderlust, and follow our 10-step checklist, you’ll be more than ready to conquer Kilimanjaro and reach the Uhuru Peak like a champ. If you still want to do more research on this amazing hike, you can learn everything about our Kilimanjaro hike HERE. What are you waiting for? !